About a year ago, we bought Bronte's first bike helmet at MEC. We picked MEC brand Speed Cycling helmet that seemed to fit well & had a fairly flat back, which is a great feature for a kid who's got their head against a bike seat back most of the time. It was also really affordable: $17. Within a short time, the inside band came out of the helmet, as it was only attached with stick-on velcro pieces. I added more velcro, hoping I could keep it together, since it was otherwise a great fit with a dialing adjuster at the back. As Bronte got older, she started pulling the band down over her face while we were riding, leaving the scratchy part of the velcro against her forehead. The band is completely independent of the straps, so the helmet was still on her head, but looser. I probably should have returned it last summer, but for some reason, thought she'd get out of the habit of pulling it apart. Nope. She also started taking out all the foam pieces inside & we lost the one across the back. She also peeled the fabric layer off one side of the foam inside the top. This week was the final straw: she figured out how to yank then helmet forward & completely off her head while I was riding yesterday. 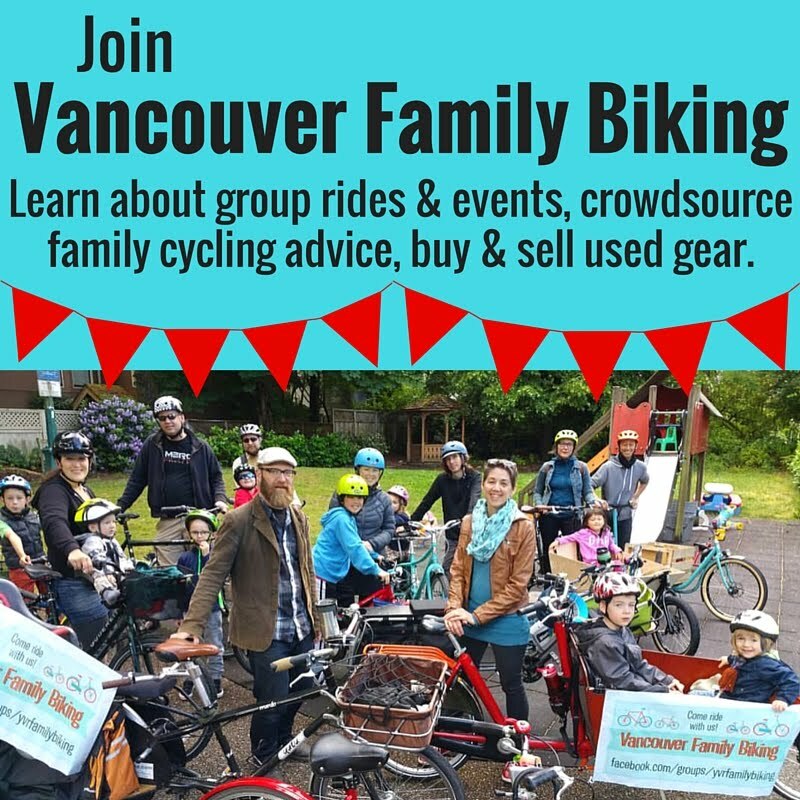 Judging by the seven bad reviews & 2.5 stars out of 5 on mec.ca for the Speed helmet, we didn't get a defective model--it's just not a great product. Several other people have written of the same issue with the fit band falling out. MEC responded to one review saying it shouldn't be a safety issue, but if the helmet can be pulled off that easily by a 21-month-old once the band is removed, I don't trust it. I'd really like to see MEC pull these off the shelves & redesign this helmet to make it stay together. 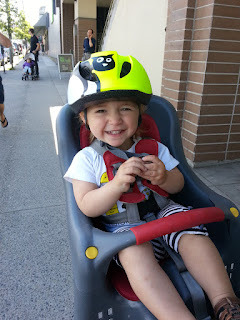 So off I went to Bicycle Row (that stretch of Broadway with All The Bike Shops near MEC) to check out toddler helmets at Bike Doctor & MEC. I only found two in her size at Bike Doctor, one of which was a Nutcase & very heavy. Not great for a little kid who still falls asleep on the bike often. The Giro toddler helmets they had featured very similar straps & inside band to what I was returning to MEC, so I passed on that one. 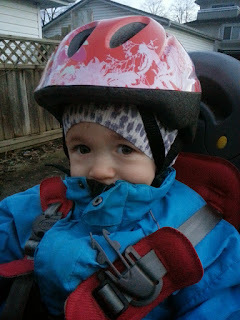 At MEC I beelined for the MET Buddy helmets, which I'd considered a year ago. They're a little bigger than the MEC Speed, & more pointed at the back, so they wouldn't have been great for her when she was only seven months old. Since she's getting close to two years now, they're a better fit--quite low on the forehead, however. The straps inside have a slightly tighter fit at the back & the adjustable inside band is attached permanently to the helmet, so the only thing she should be able to disassemble is the foam pads. We returned the MEC Speed & picked up the fluorescent yellow MET Buddy helmet for $32--there are a few other designs available too. Though she was resisting with all she had in the store when I attempted to try it on her, she was happy to put on "my new hemmet" as soon as we were at the bike. Toddlers! I'll post a review of the MET Buddy once Bronte's had a good go at it so we can really tell if it's an improvement on the MEC Speed. Disclaimer: I bought both of these helmets & was not compensated in any way for this review.